Blaze, a Marvel comic-loving teen and aspiring artist, is determined to get Mark the Soccer God to finally notice her as girlfriend material, and not just the fill-in soccer mom to her younger brother and his rowdy friends. And when Mark finally takes notice, Blaze is thrilled…except Mark isn’t the guy she thought he was. In fact, he turns out to be quite the shark. And there is nothing quite as fearsome as the revenge of the Blazing Goddess. 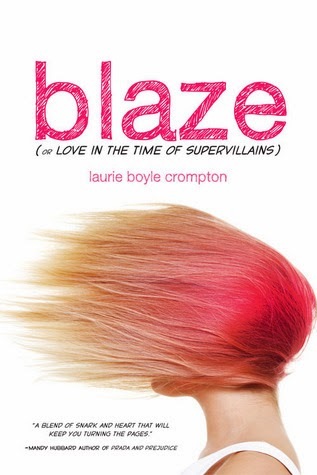 Blaze, Or Love in the Time of Supervillains is full of snark, good humor, and plenty of painfully awkward moments as Blaze fumbles her way through her first relationship and learns a few things about herself along the way. Superhero metaphors and allusions abound in this quirky story, and Blaze’s voice is very strong and distinct. Her endless optimism balanced with a sarcastic tone make her a funny, likable narrator who learns to deal with disappointments in life with grace, flair, and plenty of nerdy humor. Crompton’s debut novel is intelligent, unexpectedly sweet, and full of attitude. Cover Comments: If you don't pick up the novel for the synopsis or title, you'll definitely pick it up for the fantastic cover! Like the book, this cover has so much attitude. I absolutely love it. Many thanks to Cori McCarthy who introduced me to this book and let me borrow her copy! Glad it turned out to be such a good book. I was intrigued by it but was refused by NetGalley, so I was waiting for someone to review it to see if it was worth the buy, it sounds like it is!! The cover is awesome. I love the premise too! Will add it to my list! It's Halloween Week--What Are You Reading? New Nerdbait Guide is Up!